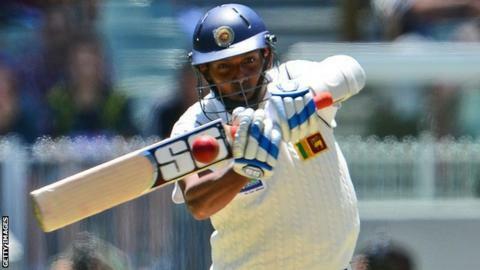 Sri Lanka batsman Thilan Samaraweera will meet the national selectors on Wednesday after expressing his desire to retire from international cricket. He has written to Sri Lanka Cricket, who asked for "meaningful dialogue" before "finalising such a decision". On Monday, the 36-year-old was one of 22 players to sign central contracts with SLC to end a pay dispute. The right-hander recently agreed a deal with English county side Worcestershire to be their overseas player in 2013. He scored double centuries in successive Tests against Pakistan in February and March 2009, but the day after his second double ton, gunmen attacked the Sri Lanka team bus in Lahore while they were heading to the stadium for the third day of the Test. Samaraweera, who was shot in the leg, was the most seriously injured Sri Lanka player in the attack, but returned to international cricket four months later. He began his career as an off-spinner, but made 103 not out batting at number eight on his Test debut against India in 2001, and swiftly became a middle-order anchor for Sri Lanka. Primarily a Test specialist, he has scored 5,462 runs in 81 Tests, at an impressive average of 48.76 - and memorably took eight hours to score 142 against England in 2003 to help set up an innings victory. His batting style has been less successful in limited-overs cricket, but he has appeared in 53 one-day internationals, making his final ODI appearance in the 2011 World Cup final defeat by India in Mumbai. He then wrote himself into cricket history in April 2012 by scoring the two millionth run in Test cricket, playing against England in Colombo. Samaraweera was announced as having signed a "special category" contract by SLC on Monday, along with fellow Test specialist Prasanna Jayawardene, as neither player was in contention for the limited-overs side. However, Samaraweera, who struggled with the bat in their recent Test series in Australia, was left out of the 16-man squad for the first Test of the upcoming series against Bangladesh.